It seems to signal a new tone, if not a new approach, by the Government. Gone was the needless and fruitless lecturing of the eurozone, the counterproductive demands for Germany to pick up the tab for the crisis and the intellectually inconsistent approach that has characterised the UK Government’s rhetoric to date. In short, it has been a complicated mix of demands for a federal eurozone, while threatening to veto the very same thing - 'eurosceptic fiscal federalism' as we've dubbed it. “…The EU is already a diverse place and with further enlargement it will become more so: by the time all the Western Balkan nations join there will be more than thirty countries in it. Its peoples do and will want different things from the EU. Some will be in the Eurozone and some not. Some are comfortable with ideas of federalism, other are not. Some, like Britain, play an active part in foreign and security policy, others find its practice difficult. Some yearn to go further in opening up markets. Others find the idea threatening. This was not the finished article by any means but it did signify that the Government (or at least its Conservative part) might finally be coming around to the idea that it needs to explain to the rest of the EU - and UK voters - what it wants from any future renegotiation (Hague also outlined the UK’s review of EU powers), and where the referendum will fit in. The question is whether Cameron’s much anticipated speech this autumn will deliver. Comes back to the same old question, who to believe and when ? is this another handful of crumbs to feed the elephant in the room or a genuine attempt to move the position of the government ? "We respect the democratic decision of the countries of the Eurozone to preserve it." Why is Hague suggesting that there is anything "democratic" about the structure and functioning of either the Eurozone or the EUSSR? He's a faux EUSSR-Skeptic who wants to keep the UK imprisoned in the EUSSR, so that he can one day ride the EUSSR gravy train. Seems like they have their strategy now both at home as in Europe. Great technical piece of work btw, brings the message across very clearly and doesnot allow anything (that isnot unavoidable anyway) to stick to him personally. probably Mr Cameron will be a bit sharper/harder as he is the one who has to get reelected (and Hague the one that has to do most of the reneg). 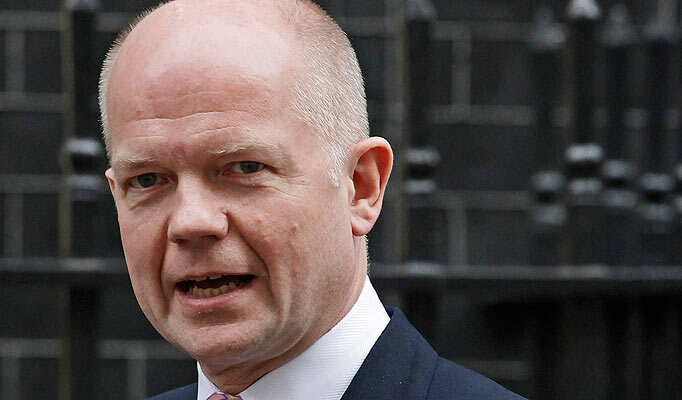 Looks like Hague also established a working relationship with Germany on this issue like OE suggested. Another positive. He can try one with Sweden and Holland as well, both are very likely positive. Even can get closer than with Germany as Merkel has the Euro-mess hanging on there as well. Anyway getting reeleted is pretty similar as selling soap. Deliver on the main things that you have promised. So Mr Cameron will simply have to continue this way if he wants to be reelected. He has not much choice. Also is restoring credibility will go rather similar to soap (after you made a miss with that). Simply show that this time it really is different. That the voter does count (and things didnot go completely correct earlier) and keep confirming that message till the public accepts that. Which in case of Mr Cameron and the EU has some way to go yet. But clearly going in the right direction. It is noticeable that the German press did not show any interest in this lecture. In fact I cannot trace mention there at all. So why didn't he make it to Parliament where he could be questioned? It's a dog's dinner of a policy - old left-overs rehashed. We heard this all before and is the classic tactic of 'smoke and mirrors' - NOTHING will happen as a result except (if they ever heard it over the Savile clamour) the public will go back to sleep and we will go on sending our cash to Brussels while they run our country. Next Episode: the IN-IN referendum and the failure to claw back powers or pounds. He will mean it. Cameron wants to be reelected and doesnot want to put UKIP on the map. 1. To get reelected one usually needs a proper running economy. We can forget that. No one will get this economy running again the next couple of years. Simply too much rubbish that has to be cleaned up resp. structurally changed. 2. Cameron is behind in the polls and considerably. Basically if Labour would have a proper leader (not the failed highschool teacher type like Mr Ed), Cameron would be toast with the next election. 3. So Cameron needs something else. In spite of what one would think while reading the English newspapers voters look mainly at the big issues. What could be a reason that a large group voters would start voting Cameron. -reorganise the NHS and assure longer term healthcare for the population in the process. People in Europe in general like their healthcare. Problem being it is simply getting too expensive. So one way or another it has to be reorganised (aka cut with respect to very expensive stuff). Difficult one to do as the rest of Europe shows and very time consuming. No way that will work before the next election. 5. Assure for the middlegroups that they have the social security network. Also this one gets way too expensive so need cuts and big ones. With as options cut for everybody basically meaning that the middlegroups will effectively not be covered or cut mainly for the people that use welfare as a way to finance their lifestyle. Probably longer term no other options. This might work. With the added advantages that the groups hit by the cuts are no conservative voters anyway and the group that benefit feels now the danger of cuts already and is often able to judge longer term policies. But still very difficult to sell politically. Probably wise to start working on this as well. Middlegroups more like European middleclass. UK middleclass probably less interested anyway and simply too small as a group. 6. Leaves Europe. With as large added advantages that a) it makes the UKIP most likley a smaller problem. : and b) the EU needs a treaty change more than the UK at this moment and short term as well (and need cameron for that). 7. It is his last realistic chance basically to get reelected. If he messes this one up he is politically dead, basically do or die. And read SunTzu that is a very good position to get the best re fighting spirit out of somebody. Plus the other side wants a low profile UK reneg in order not to upset the markets and need Cameron cooperation to change the treaty to deal with the debtcrisis. So my calculated guess is he will go for it and is likely to succeed in a real change of the relation. But it won't happen in a day it needs time. Relations cannot be stopped from one day to another, as some people want without running the chance to tank your economy. I do not know how you know about the economy. But we are as busy as we have ever been; and so are many companies. The exports to Non EU are picking up. The economy will be well again by the time the election is due. Don't let that persuade you to vote for 'Cast Iron Pledge' Cameron, though. The first party who promises an IN OUT Referendum and promises to abide by the result will win: deservedly. First of all great that your company is busy. But roughly everybody who gives estimates of the economy as a whole is pretty negative for the next 1 or 2 years (IMF, Worldbank, BoE's Merv the Perv etc). And nobody can really indicate how it should start up again. Difficult to see how the economy can be helpful in any election in 2015 for any government (whether Labour, Conservative or something else). Basically for the UK a lot of garbage will have to be cleaned up first. Banks, with their bad loans and bad capital positions; government (with all the nearly useless civil servants added during the Blair/Brown age) in particular. The best sector looks export to non EU. I agree yet again with Christina. This is just all wind and I doubt very much whether we will get our very long craved for referendum on whether we wish to continue to subsidise the profligate bottomless pit pof an EU gravy train. We need to stop paying 51 million pounds to the EU each day. this is a passionate discussion in process as to the renovation and realisation of the european union - i think this is a healthy process to which we are all privy. wonderful! I believe the only way Cameron will be re-elected is by holding an IN/OUT referendum on Britain's relationship with the EU . Rollo is right , whichever party offers it will win . Cameron would do well to hold it simultaniously with the general election , to show good faith that he will not renage afterwards . I do not believe renegociation of laws or whatever will work or satisfy the British public . Hague is right the EU is a one way system that only favours the EU . If Cameron is committed to keeping Britain in the EU , he should stand aside and let somebody else lead the Conservatives . I do not see anybody in the present cabinet whom I'd welcome to step into his shoes . The EU is digging an ever deeper hole for itself , that endangers every member state and that it will never get out of . So just how many times do parties offer a referendum, only to deny one when they get into power, so far ive seen four, Blair twice, Brown once, Cameron once. we are not going to get a referendum don't you know, can't you see. The only way you will get a referendum is vote Ukip, or stand as an independent MP. Sorry people but this plan was in force before most of you were born and there's even nastier things planned, you're not getting out yet.